With such a wide range of choice, we'll be focusing on guiding you through the top Fossil watches currently available. Whether your priority is style or activity, touchscreen or hybrid, we can help you out through this buying guide. We've detailed each choice below in our extended reviews, but here's the best place to get a condensed look of the latest and greatest Fossil tech. Though features like NFC, GPS and heart rate monitoring are now a staple among the Fossil clan, the Sport is the only one to come with a design to back them up. It's colourful, comes in size options for bigger and smaller wrists and is also one of the few smartwatches on the market to be powered by Qualcomm's new Snapdragon 3100 smartwatch chip. Melding together a sleek design with heavyweight tracking features, the latest iteration in this women's line is the best yet. Now packing NFC for payments, GPS for proper sports tracking and waterproofing for swimming, the Q Venture HR is able to handle your daily workout and still look stylish enough to keep on for the rest of the day. It comes with both metal and silicone bands. Among the troupe of hybrid smartwatches produced by Fossil, the Q Neely is among the best in class. It's affordable, but that doesn't mean it skimps on features, handling phone alerts, music control and basic activity and sleep monitoring. And nobody will ever know this isn't a regular watch. The latest device to come from Fossil HQ, the Sport is also the company's first to feature two case sizes – 41mm and 43mm. As we mentioned above, the touchscreen smartwatch is one of the few to feature Qualcomm's battery-extending Snapdragon Wear 3100 technology, too. So, what are the other key selling points? Well, if you're in the market for a sporty smartwatch from Fossil, it doesn't come more focused on activity tracking than the Sport. Features like heart rate monitoring and GPS tracking may be available in other devices from the company, but none come with the same design. That's an important factor, because, after all, nobody wants to run with a metal or leather band on their wrist. In total, the Sport comes in six different colours (silver, blue, red, gold, rose gold and grey), with 28 band and bracelet styles available for customisation. Whichever option you plump for, the AMOLED display (offering a pixel resolution of 390 x 390) is, on paper, as strong as the Apple Watch and Samsung Galaxy Watch. And its 35-40g weight also makes it significantly lighter than rivals, which, again, makes it ideal for activity. Undeniably one of the premier women's smartwatches on the market, the Q Venture HR is the fourth generation touchscreen device from the company. 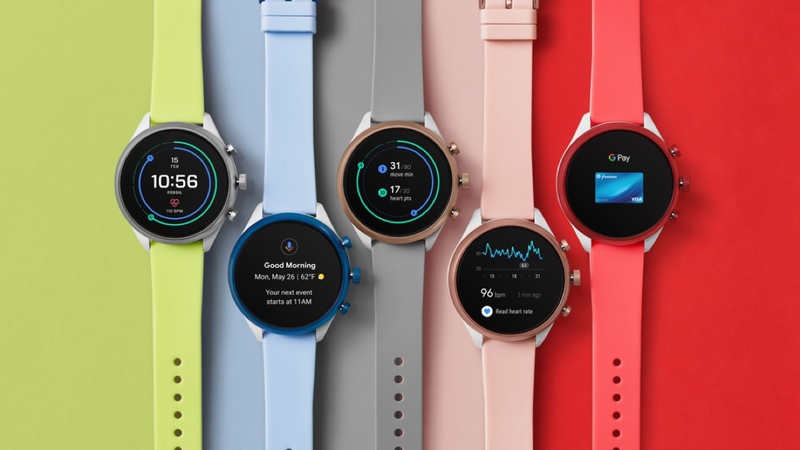 The most recent iteration brings a heart rate monitor, built-in GPS, waterproof design and NFC, and Fossil has done a strong job of keeping the 40mm design relatively slim despite all the new technology packed inside. Speaking of design, there are now more options than ever. Nine cases are available to choose from, all 13mm thick, and interchangeable bands allow you to switch between metal, silicon and leather straps with ease. This offers a more general, lifestyle design when compared to the Fossil Sport, despite the same activity monitoring smarts. It's also able to leverage Google Pay and let you pay directly from the wrist. All in all, if you're looking for a stylish all-rounder with a touchscreen from Fossil, this is your best bet right now. The headline act here, however, is still its looks, which makes the arrival of the other features all the more impressive. This is one of the best looking touchscreen watches you can buy for men. If you've got smaller wrists, it may not be as great an option, but for everyone else, there are very few smartwatches that look better. Fossil has mountains of hybrid smartwatches to choose from for both men and women, but one of our favourites in the space remains the Q Neely women's watch. Compatible with both Android and iOS devices, the 36mm case is light, classy and relatively slim, coming in at 12mm. Of course, what's even smarter than the physical design of this hybrid is the fact that all the tech is hidden under the surface. You're not getting the same interaction and tracking experience as you would with the touchscreen options above, but this is a great option for beginners or those who don't want the look of a traditional smartwatch. As we've mentioned already, Fossil has a veritable tsunami of smartwatches out in the wild – and that means you can pick up older models along with a nifty saving. The perfect example of this is the Fossil Q Explorist (and the woman's equivalent, the Q Venture), a third-gen smartwatch still available for a slight reduction on its upgraded counterparts. Unlike the fourth gen edition, you won't get the contactless payment support or the same activity tracking smarts, but considering the line is lifestyle-first anyway, there's a good chance these won't be deal-breakers for you. And, of course, it'll still be offering smartwatch basics such as Android and iOS compatibility, step tracking, notifications and music control.